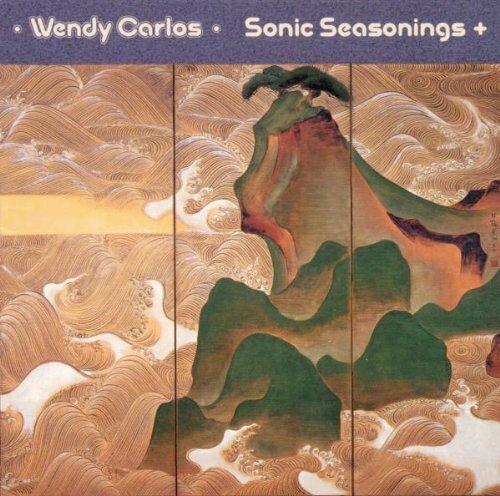 Proving that you have to go back before Brian Eno to find the roots of ambient electronic music, we now finally have the reissue of one of the field’s first classics, Wendy Carlos’ Sonic Seasonings. The story of Carlos’ influence on electronic music dates to the beginnings of analog synthesizers, yet of all her works, this is one of her finest, a double album of side-long portraits that has been long overdue for reissue and has been remastered for incredible sonic clarity. East Side Digital has done fine work in rescuing this relic, adding another unreleased album from 1986 to make the set a great buy, the additions of equal quality to the whole. “Spring” is full of thunderstorms and natural ambiance, blended with the electronics, it speaks of birth from disorder. The rainstorms that dominate the first half find resolution in bird voices, the analog synths both play strange melodies and create an atmosphere full of potential. “Summer” is a strange analog soundscape. Carlos' atmospheres contain a great number of tones and frequencies, and this reminds me of some of the early work of Necropolis / Peter Frohmader. Buzzing, steely sounds rise barely above the soundpool, the results dissonant and unearthly. “Fall” closes the first CD, and is another piece that incorporates natural recordings; the sounds of waves predominate here, but there are many others including what sounds like the crackling of an open fire. The electronics are incorporated seamlessly, still used in abstract and unusual fashion. Sonic Seasonings finishes with “Winter,” which is the first track on CD 2. Of all four pieces, this resembles the closest to what we generally refer to as ambient today. It speaks of an arctic climate with howling wolves and windy electronics, icy and frigid northern landscapes. Its strange analogs remind me of parts of Tangerine Dream’s Zeit recorded the same year. The fade out is a choir of human voices (producer Rachel Elkind), wolves, and more; an eery sound more than reminiscent of the dissonant vocal finale of Il Balletto di Bronzo’s Ys. Accompanying “Winter” on CD is a five-minute alternate ending, a strange and much different one with lots of sound effects, creaking doors, animal sounds, and more. The entire album still sounds fresh today, a groundbreaking work that belongs on the list of classics by Tangerine Dream, Klaus Schulze, and Brian Eno. Land of the Midnight Sun is a revelation. Moving forward 14 years into the 80s, we are treated to the type of opus Michael Stearns could have written with “Aurora Borealis.” The shimmering sounds and beautiful synths are squarely in the vein of albums like Jewel or Planetary Unfolding, the richness and beauty act as a counterpoint to the more abstract visions of Sonic Seasonings. “Midnight Sun” itself ties up the set nicely, being quite analogous to “Sonic Seasonings.” While 1986 brings us squarely to the digital age, Carlos’ choice of tones and sounds are equally as rich, it sounds like there are still a lot of analogs at work. Spacious, dynamic, and full of both warm and icy tones, it is a truly mysterious and beautiful work. Well over two hours of excellent music, this is one of the best reissues of the year, Land of the Midnight Sun of high enough quality that it could have stood on its own. We have ESD to thank for giving us our money’s worth. "Cymbals at Dawn" — Invitation to a Duel?